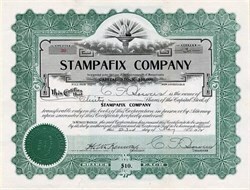 Beautiful certificates from the Stampafix Company issued in 1912. This historic document was printed by the Goes Company and has an ornate border around it with a vignette of a torch among the clouds. This item has the signatures of the Company’s President, Charles F. Bowers and Treasurer, and is over 87 years old. 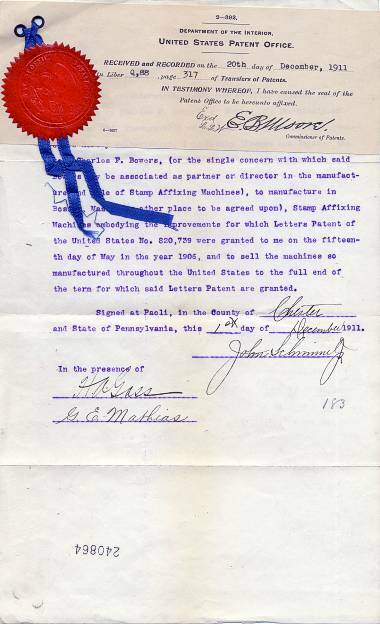 Package includes 3 stock certificates and the patent shown below. The company made Postage Stamp Affixing Machines (Patent # 820,729). The machine was invented by John Schimmel, Jr.